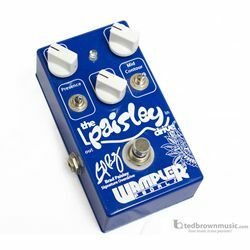 The Paisley Drive was designed for Brad Paisley to give him that great tube saturation like he would get from his Trainwreck amps, but at manageable volumes. Trainwrecks are known for being extremely touch responsive with loads of smooth, liquid sustain. These amps are very rare, so it took a bit of time and several prototypes before we landed on a design. However, despite it being created as a signature for him, it’s capable of a lot more. It works really well for most any type of country, rock, and blues for a bit of breakup to full on fat saturation..
One of my absolute favorite parts about this pedal is the response it has to pick attack and volume control. Set the gain and volume for a slight boost, then just roll back the guitars volume knob and it cleans up, and then roll the volume back up for boosts for solos. It works great with single-coil guitars, giving them an extra depth and punch that single-coils can often lack. It also works really well with humbucker-equipped guitars. On the humbucker guitars, the drive is a bit fatter, and the saturation has more *chunk* to it, for lack of a better word.